An international group of scientists aboard the high-tech research vessel RRS James Cook left Southampton on May 19 for the Porcupine Abyssal Plain – Sustained Observatory (PAP-SO) in the northeast Atlantic Ocean on an expedition that aims to answer fundamental questions about how potential environmental and ecological stressors are influencing the open ocean from surface to seabed. The researchers will track the flow of the greenhouse gas carbon dioxide from the air into the surface ocean, and the eventual fate of this carbon in the ocean depths. They’ll also make detailed measurements of litter and plastic accumulation in the open ocean. 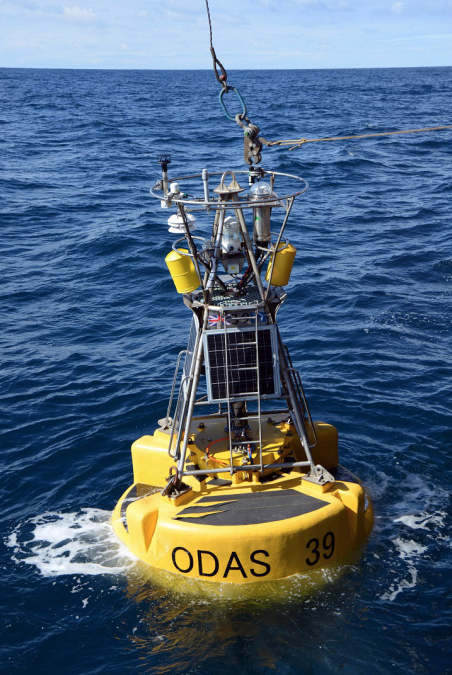 Led by the National Oceanography Centre (NOC), the seagoing team will use a variety of tools including instruments fixed to a floating buoy, specialized sediment traps to collect sinking particles, and samplers of the water and the seabed three miles beneath the surface. The team will use these sediment traps and samplers to measure microplastics in the water column and in seafloor sediments. Alongside the NOC’s unique long-term record of samples, these will provide information on the now common occurrence of plastics far from the coast. A research expedition to the PAP-SO is undertaken every year to service a mooring that has a range of sensors measuring variables such as temperature, oxygen and nutrients. Each year, new and innovative ocean measuring equipment is tested at this site. Over the last three decades of sustained ocean observing at the PAP-SO, scientists have seen a number of major changes in seabed fauna. This latest expedition will use the remotely operated vehicle HyBIS to survey the seabed. The HyBIS system will be used to take thousands of seafloor photographs to investigate what is driving these dramatic changes. HyBIS will also be looking for plastic and other litter at depths of up to 4,850 meters (about three miles). The PAP-SO, where these measurements and experiments are being conducted, provides key time-series datasets for analyzing the effect of climate change on open-ocean and deep-sea ecosystems. A wide range of international scientists have been collecting data at this site for decades, and this latest voyage will include participants from Brazil, France, Germany, Italy, Portugal, U.K. and U.S.